We often think of memory in terms of remembering a birthday or forgetting a face, but it is actually a far broader concept. Put simply, memory refers to the many routes through which the past can influence our psychological present. It can span everything from how an athlete perfects their game, to why your mouth waters when you think of something appetizing, to how you’re able to draw meaning from reading these entries. Although sometimes faulty and incomplete, this collection of our skills, habits, and experiences profoundly determines who we are and how we interact with the world. Psychologists and philosophers have spent centuries trying to categorize and scrutinize the different forms of memory using tools ranging from introspection to brain-damaged patients and neuroimaging. In our lab, we focus on how various kinds of memory influence other aspects of the mind, and on how such interactions are implemented in the brain. For example, our research considers why humans remember and forget specific events from the past, how we retain and manipulate information in our mind over a short delay, and how repeated patterns in the world influence what we perceive and how we act. What can we learn from people with brain damage? To be sure that a particular region of the brain is critical for some behavior, we need to know what happens when the brain region is no longer functioning. This kind of experiment has been performed in animals, where a part of the brain is inactivated. Such invasive experiments would be unethical in humans, however, and so we must rely on patients who develop brain damage from illness or trauma. For example, much of what we initially learned about memory came from patient Henry Molaison, also known as H.M. He had a surgical procedure in which his hippocampus was removed to treat intractable epilepsy. After this surgery, he exhibited severe anterograde amnesia, that is, he was unable to create new memories. This provided compelling evidence that the hippocampus is critical for memory. This kind of surgery is no longer performed, but amnesia still occurs naturally as a result of viral encephalitis or other conditions. Patients with amnesia can appear normal in many ways. They still have intact language abilities — able to read, write, and converse. They can also have intact motor skills, such as riding a bike or playing an instrument. These preserved abilities tell us something about brain function too, namely that the damaged region is not critical for these behaviors. What happens in a behavioral experiment? Psychology is full of interesting questions and interesting ways to test them. A lot of the research in our lab involves behavioral experiments. We call them “behavioral” because they examine human behavior as the primary measure of interest, as opposed to other methods used in the lab that study brain function or brain damage. There are lots of different tasks used in behavioral experiments and each one differs in terms of what you are asked to do. When you arrive to participate in a behavioral experiment, you will be welcomed, given a consent form to read and sign, and instructed about what task(s) need to be completed. Most of our behavioral experiments are computer based. 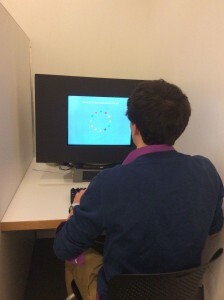 During these tasks, you watch something on a computer screen and use the keyboard or mouse to make responses. The tasks our lab uses vary widely, including asking you to report what images look like and testing your learning or memory for certain information. Each task addresses a different research question and offers a slightly different experience to participants. By studying behavior we can continue to gain rich insights into how the mind works. How does brain imaging work? A lot of experiments in the lab use a tool called Magnetic Resonance Imaging (MRI). This powerful tool allows us to study how the human brain works. 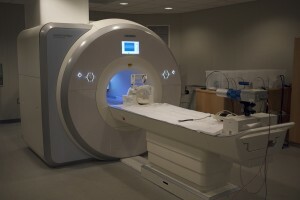 An MRI machine (or “scanner”) is essentially a huge and very strong magnet. This magnetic field acts on the atoms in the brain. In particular, it changes how those atoms rotate (or spin). When there’s not a magnetic field, all of the atoms spin in random directions. But in a uniform magnetic field, the atoms spin in the same direction. Then, during an MRI scan, we introduce brief bursts of radio waves (like a radio station) that knock the atoms out of alignment. We measure how many of the waves are resonated back out of the brain as the atoms realign. To study brain activity and not just anatomy, we use a slight variant called functional MRI (fMRI). The process is basically the same, but we’re looking at a particular molecule, hemoglobin. This molecule transports oxygen through blood vessels in the brain. When an area of the brain is active, it requires a lot of oxygen as fuel, so hemoglobin with oxygen floods the area. When an area is inactive, there is proportionally less oxygenated hemoglobin. Fortunately for us, hemoglobin with and without oxygen has different magnetic properties. So we are able to infer where there has been neural activity.